One of the most unique experiences of our entire Silverstone weekend was this year's Honda Dreamfields campsite. For 2008, in order to support their Earthdreams marketing programme, the team hooked up with a company called myhab to provide us with our weekend accommodation. We'd never heard of them prior to the event, but a bit of Google due diligence informed us that myhab provide luxury festival accommodation that's green and hassle-free. Or to put it another way... they make tents out of cardboard! I'm not sure that picture really does the concept justice, but we basically spent three days living in an oversized bread bin. 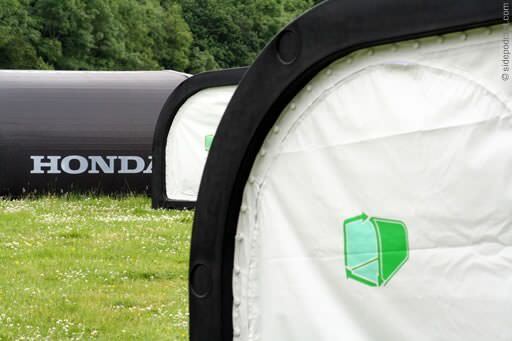 Apparently, Honda planned to use these last year, but they weren't quite fit for purpose, so a conventional tent it had to be. This year however, our field was full of these cardboard houses and it was quite a sight to behold. Certainly they attracted the attention of passers by, and security on the gate spent more time explaining the concept than anything else. The theory is that everything is made from recyclable material and the myhab team manage the entire lifecycle of the product. They turn up and install the enclosures before your arrival and then take it down again when you're done. The original objective was to address the problem of abandoned tents left behind after many of the summer music festivals. That sounds like a wonderful idea on (recycled) paper, but what are they like to sleep in? The first thing to mention, is that a "hab" is much more spacious than any other tent we've occupied. It always seems a hassle squeezing into a sleeping bag inside a standard igloo, but there's plenty of room to manoeuvre in these things. The cardboard also took a severe battering during the weekend (and wasn't helped by me spilling a cup of water on the roof the moment we arrived), but it held up perfectly. I would say the rain was slightly noisier than might otherwise be expected, given the flat roof. But as Christine pointed out on the first night, there's no guide ropes to trip over in the pitch-black, so walking around the field was a much safer experience than last year. Internal tubing also provided a great place to dry damp clothing and because both ends can be opened it didn't get stuffy when the sun eventually shone. All was not perfect though. In a traditional tent you often have one sealed end while the zipped entrance is usually augmented by a secondary area which helps protect those inside from harsh winds or rain. Because these bread bins have zips at both ends, and no secondary cover, it meant things got quite draughty during the night. We've honestly never been so chilly, and I don't think it was all down to the weather. Things weren't helped by the razor-thin sleeping bags the company provide. Described on the site as "soft bedding", I'd suggest "akin to napping under Rizla paper" might have been more apt. Minor criticisms aside, it is a great concept though and don't let my pen-pusher, office-man whining deter you from giving them a go. We have to thank Honda for introducing us to the idea and it's good to see those green credentials permeating more areas of the company. If you're interested in booking yourself a private kennel for somewhere like the Reading or Leeds festivals, more information can be found at myhab.com or alternatively there's a facebook page too.